A Reporter is JMRI's way of representing information reported back from the layout. The initial implementation is for LocoNet (Digitrax) transponding, where the Reporter provides access to information from Digitrax BDL168 cards with RX4 transponding sensors. When the BDL168 reports that a decoder has been seen in a transponding block or is not longer visible in the block, the corresponding Reporter will display messages like "1234 enter" and "1234 exits". There is also a LocoNet Reporter implementation for displaying messages from Lissy detectors. The Reporter Table provides easy access to the contents of all Reporters that JMRI knows about. 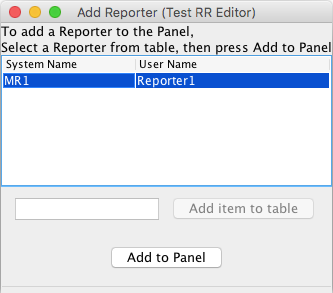 There's also an "Add..." button for creating your own internal Reporters; JMRI automatically creates Reporter objects for devices on the layout.